As an adult reading The Society, I'd give it 4 solid stars. Thinking back to my reading tastes as a young adult, The Society would have hit all of my favorite notes: thrilling pacing, mild romantic triangle to keep me turning the pages, and friendship troubles. I believe most young adults would give the novel 5 stars. I was hooked on page one with the introduction 3 years in the past as a 13-year-old girl deals with her father's trial, the loss of her best friend turned enemy, and the abandonment of her mother. This gave me the feels, and had me flipping the pages into the present time. This was a very moral novel beneath the surface, showing both why good people do good and bad acts, and why bad people do both good and bad acts, and how there is a very thin line separating the two. Even justified in your actions, the results may be more than you bargained for, more for everyone involved. Frustrating was the core feeling I had for Sam/Samantha while reading The Society. After not only losing her best friend, she has to suffer at the hands of the person who should have had her back after her life incinerated. Jessica not only bullied Sam, she turned the entire school away from her. In reality, this is realistic. Fed up, Sam seeks not vengeance but revenge, and there is a difference. I won't give out details, as I feel that would do a disservice to readers. But there were a few points in the book that I would have liked addressed. The moral of the story was incredible, taking responsibility for your actions without using projection. (So & so did it too, but they didn't get in trouble so I shouldn't either. Yes, you should. But actions should be taken so the rest take responsibility as well.) BUT after three years of bullying, I would have liked to see some justice for Sam, some closure dealing with her father/Jessica/Trinity. Everyone failed Sam, including the school, Jeremy, and the aunt, with no one stepping in to STOP the bullying that was so prevalent. In fact, her bully was made out to be the victim. I understand taking responsibility for your actions, and not allowing someone to lower you to act as they do. Sam went from ignored victim to criminal, where all the victimizers were labeled and shown as innocent victims, all of whom had a major hand in changing who Sam was at her core. Everyone knew it was happening, saw it was happening, but just told Sam to deal with it and wait to get to college. I would have liked to see some outrage in Sam toward those who were meant to protect her. The only life ever ruined on the pages of The Society was Sam, from start to finish, with only Sam ever taking responsibility for her actions. Even the BFF/love interest was cowardly by never telling Sam how he felt, leaving it to Sam to figure it out, while he flirted with others. To be fair, there was Ransom, but there would have never been a Ransom if Jeremy would have spoken up. Such as taking her to a party, where both were excited to be with one another again, only to leave her the entire night after going to get her a drink (he never did bring her that drink), completely forgetting about Sam. It was written Sam was Jeremy's focus, yet he lost focus too often for me to buy the epilogue. Kudos to the author for showing Sam's empowerment even when at the lowest of the lows. I just wish someone in the cast of characters would have shown similar growth/responsibility/redemption/courage/protection/non-judgmental attitude/Self-reflection. There is having Sam take responsibility for her actions, accepting how she contributed to her role, forgiving to not forget but move on, but empowering it is not to allow yourself to be a victim by not sticking up for yourself. In this, I mean, like how Sam spoke to her father. The author had to opportunity for Sam to do the same to her aunt, her mother, Jeremy, Jessica, her classmates, and the entire school administration. SOMEONE. By the end of the book, I just felt Sam was setup to be an apologist, with everyone just running right over her because her feelings weren't of value. Tell someone when you're being bullied should have been another added moral in the story. If that person doesn't take action, they are as much at fault as Sam was for turning bully to protect herself. I know where the author was headed, and I appreciate it, especially to show young adult the perils of bullying, but I feel it also gave the wrong message. The bullies won, don't protect yourself, and only you are to blame. *I thoroughly enjoyed the quotes at the beginning of every chapter, and I hope it encourages young readers to give other works at try. Recommended Young Adult Age-range: 12+ includes kissing & bullying. Jodie Andrefski has been passionate about reading ever since she was a little girl, when she used to climb trees to escape with a favorite book. She lives and writes in a small town in Pennsylvania with her teenage daughter, and has an older son who is out and about on his own. Though still an avid reader, she now prefers a comfy chair over the crook of a tree. An unapologetic coffee fiend, she’s even happier if her java comes with pie. 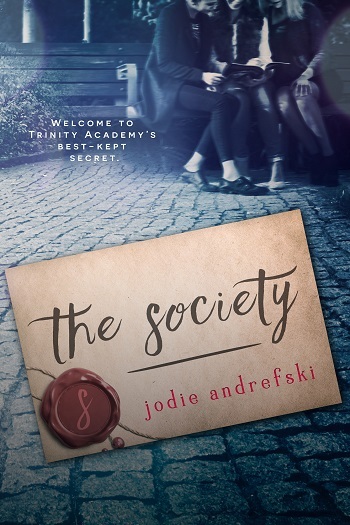 Reviewers on the Wicked Reads Review Team were provided a free copy of The Society by Jodie Andrefski to read and review.